Another famous card. 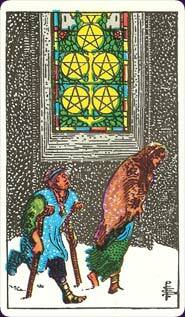 Two poor folk sit outside a church with five pentacles on its stained glass window. This is a card that predicts loss, financial loss, bad luck, a set-back in health. It is a difficult time, as all fives are. The poor folk feel embarrassed by their poverty, but they are too proud to ask for help, preferring to rely on each other rather than begging alms from the rich church. This card relates as well to the Hierophant's emphasis on community and social norms. In some views of the card those out in the storm have chosen to be out there. The "church" disapproves of them or their relationships and rather than conform to traditional standards, they stay outside. Similar to the other fives, there is, once again, the issue of pride and humility. The problem, "How can I survive this impoverished time without surrendering my pride?" The answer: "You have to reconsider your values." While those in this card may have lost material things, even the respect of society, they still have each other. Such times teach us who our real friends are, who is honestly generous, and what really matters to us. When times are good again, we will remember what we learned in these hard times and not be fooled by sham friendships or capricious social regard. We will know who and what we can really trust. Learn the Five of Pentacles tarot card meaning and the rest of the card meanings, symbols and stories in our eBook.